Time for another loong drive a little away from the city. This time we chose to drive towards Vikarabad. So glad that our Driver agreed to come on a Sunday. A cool guy who almost always agrees to come even on a Sunday, whenever I am in the mood to go out. Went with Mom and dragged my brother too. We drove via chevella , reached Vikarabad … continued to drive towards kotpally reservoir/dam. We didn’t go close to the dam but got a glimpse of the reservoir. Very beautiful serene place. It is unbelievable that such a beautiful lake exists on the outskirts of the city. A few folks from the city seem to get away from the hustle bustle of the city to spend a day here. Do take a lot of food and water when you plan to visit this place. Don’t expect to find any food or water anywhere near the reservoir. Came across groups of bikers who seemed to enjoy an early morning ride to the reservoir. All through the route we noticed that it was mostly forest like area with hardly any cultivation. Came across very few villages and hardly saw people in these villages except for a few shepherds with their flock. Not much greenery during this time of the year. I liked the way the houses were built in some of the villages around this area. They were built in the shape of an L or U or a square with a central courtyard. All the houses were creamy/white in colour as they use the famous Tandur stones to build the walls and roofs of the houses. This place named Tandur is very close from Kotpally. Tandur tiles are very popular in constrcution of houses in Urban area s too. These stones are mined around this town. Was tempted to go and knock on one of these houses but didn’t 🙂 . There is always another time. We decided to drive back home via Mominpet and Sadashivpet. One doesn’t have to go very far out of the city for taking a break once in a while , to breathe in some fresh air and to soothe the soul. I was lucky this time with growing ‘Chukka koora’. A green leafy veggie which is also called ‘khatta palak’ in Hindi. I harvested the leaves three times so far. This leaf is used for preparing dals , chutneys and other recipes. I also got a few Petunias, Pansies and Dianthus for my Sunny balcony. Love these flowers . They bid farewell in the morning and welcome me back home in the evening. Was down with runny nose , Sore throat, Bronchitis again. Had to take Antibiotics 😦 . I have been avoiding supermarkets,Malls etc. This time the reason for the attack is a visit to one of the manufacturing shops in our factory. The meeting was in the Conference room inside the shop floor but there was no escape from the dust. Categories: Long drive, Random Musings, vegetables, veggies, village | Permalink. On my way back from work . Dark clouds and Heavy downpour at around 5pm. Clicked from inside my car. Diwali decor in our Balcony. Strings of electric lights and rows of Oil Diyas on the ledge. Marigold flowers on the Main Door. A rainy day . Spotted lots of little diamonds caught between the leaves when I reached home. On my balcony. A foggy morning near my place of work. Great place for walking/jogging. 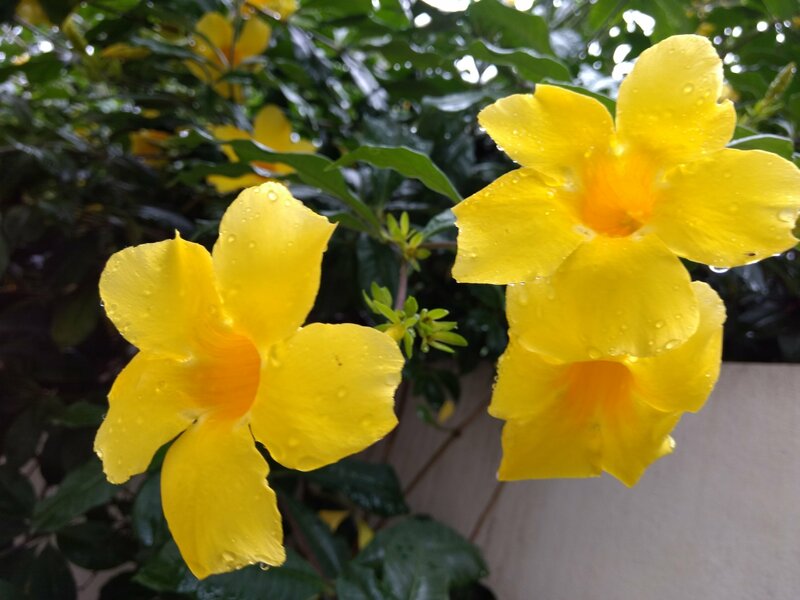 Golden trumpet blooms in our little garden. Clicked one morning while I was starting to go to work. These were drenched during the showers in the previous night. View of the lawns in ISB. This was my first visit to the beautiful campus. Mom presented this pot to me. There were lots of buds when I got the pot with this plant. Clicked this pic and sent to Mom . She would ask me if they had bloomed. Another cloudy day. Clicked this when I went for a long drive with Mom one day. Lakshmi Puja on the evening of Diwali. Tried to capture the rain drops . The scene was ethereal . Cool breeze , sound of rain , the golden glow from the street light with the falling rain drops . Tried my best to capture those drops but failed. Categories: Phone clicks, Random Musings, Uncategorized | Permalink. Our body is a conglomeration of a variety of single cellular organisms that have come together to form a body and give us a beautiful experience on this Beautiful Blue Planet . Our body is a moving colony of cells, bacteria and other micro cellular organisms inside and on our body that have decided to live together in a symbiotic relationship to give us this experience. We are here to express ourselves and not to suppress our thoughts and feelings. We have been brought onto this planet for a purpose . Each Individual is a unique package that is creative , has different thoughts , full of emotions and full of ideas which have to find an expression. So, don’t hesitate to speak and express emotions . Not letting them out leads to stress in the body and mind which results in disease. Release your emotions and thoughts. Speak up, Forgive , Forget and Let Go ..in turn get healed and live a Healthy life. It is also very important to say NO when you actually feel that way. Earth doesn’t need us, we need the Earth. The Earth knows how to repair, heal and revive itself and to continue it’s journey. It is time to save ourselves by helping the Planet to heal faster. WE make choices every moment which in turn decides the next moment . It is we who are creating our future every moment.What happens to us is mostly the result of what we have chosen to do. Let’s not blame others for whatever is happening to us. We have the power to create our world by choosing and reacting wisely to every situation that we encounter. To Worship or Pray , is to be full of Gratitude. In this unpredictable world this is the ultimate form of worship. Categories: Random Musings, self help, Uncategorized | Permalink. Today is my 6th Birthday after my Stem Cell Transplant in Jan 2012. I am off chemo since One and a half years. My Oncologist said that I can meet him after a year which is the bestest news ever. Otherwise I was meeting him every 6 months, sometimes every three months and at times every month. Thanks to Ayurveda and Mother Nature . I have never been as content as I am now. I feel like a free 🐦 bird . Happy with little pleasures in life and enjoying my work . Went to the Temple this morning with hubby and my son. Also took blessings from my parents . Feel so good to receive wishes and blessings from friends, colleagues and family. Categories: Random Musings | Tags: Birthday, Health | Permalink. Wanted to share some of the exciting events happening in my life these days 🙂 . Mom and Dad performed “Homan” followed by “Mangala Snanam” in the temple and then there was a “Lakshmi Narayana” puja at home too. All of us including the kids enjoyed the homam which started at 5 am . We had just a few days to do all the shopping for clothes, puja items, flowers , fruits etc . It all happened with a short notice. So glad that we were able to perform this event for our parents. Temple where the Homam was performed . Lakshmi Naraya Puja at home with 1000 Lotus flowers. An important activity at work currently is the migration to the new GST( Goods and Services Tax) regime imposed by the Government of India. This project is keeping me busy with several back to back meetings with other Departments to incorporate the new changes in our business processes , testing the new scenarios , preparation of cutover data which includes downloading and uploading of data to the Database , testing the monthly Return formats etc . All organisations have to migrate to the new Taxation on 1 July 2017. Projects on IIOT too are in the pipeline and I am very excited to get them implemented. I am also due for a promotion to a higher grade at work. I will be facing an interview and I think I am cool and confident 🙂 . Have been busy preparing for the interview too. My niece’s (BIL’s daughter) wedding is coming up and I am looking forward to all the fun and dressing up for the various events. The wedding is a 5 day event and I may have to travel a lot from one end of the city to the other side as they live across the city. Will be fun helping and watching the proceedings up close. So glad to be busy with all these activities. Never been this busy in all my life 🙂 . Too many events happening simultaneously. The GST and IIOT projects will keep me very busy for a few more months. I also have to take an appointment with my Oncologist as I am due for a Bone Marrow Test in a couple of weeks from now. Categories: Random Musings, Uncategorized | Permalink.